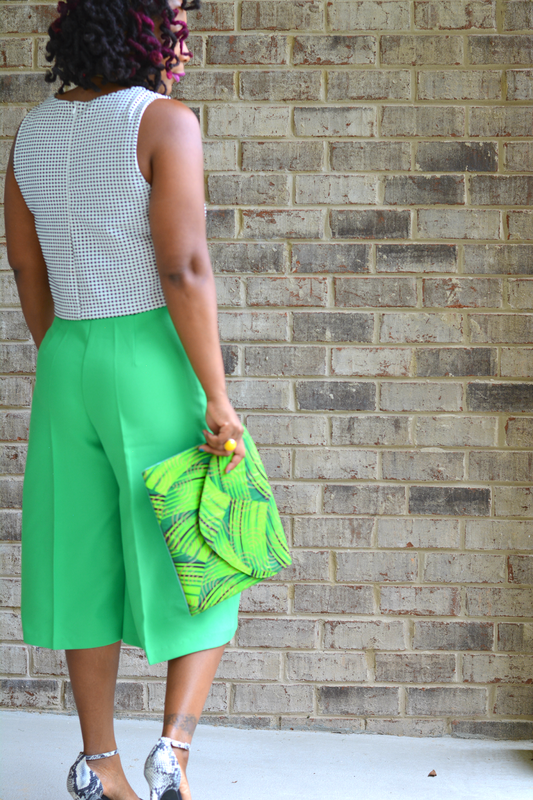 One trend I'm glad to see inching its way into fashionista closets is culottes. I have been a fan for a while. Shout out to the crazy looking Eiffel Tower pair. They were my favorite until I thrifted the high waisted vintage lime green poly pair I wear today. I found the culottes at a Goodwill in Beverly Hills. It was a bit of a shock for me. There I am trying to score some cheap designer and out pops the 70s polyester dream. I'm been lusting after the latest revival of these retro pants. Culottes have gotten a bad wrap for not being pants and not quite being shorts. Some would say they are totally unwearable and unflattering. Not I. I adore them and especially love how this high waisted, flared find fits me perfectly. I will say they are a bit restrictive with all of the holiday eating habits I've adopted. By the end of the day, that button was threatening to abscound. 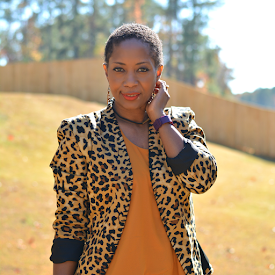 When picking a top to wear, I looked for anything in my closet that would show off the waistline. It nips and tucks in such a way giving the illusion of a smaller waist. The waistline of my 20s. It's nice to go vintage! When I do go vintage, I don't like to go head to toe. I mix in some modern pieces. The perfect length top just happens to be vintage inspired so even though I'm not in a totally dated outfit, I am feeling very retro. I lost the matching bottoms to general cheap fabric behavior so I'm glad to have discovered a new partner for the top. I was actually trying to return to matchy matchy with my choice of shoes but was sidetracked along the way and pulled out colorful baubles that I just really wanted to wear. I decided not to wait for outfit inspiration and just wear the necklace and ring. It's like that sometime. Does it work? Does it matter? Nope. 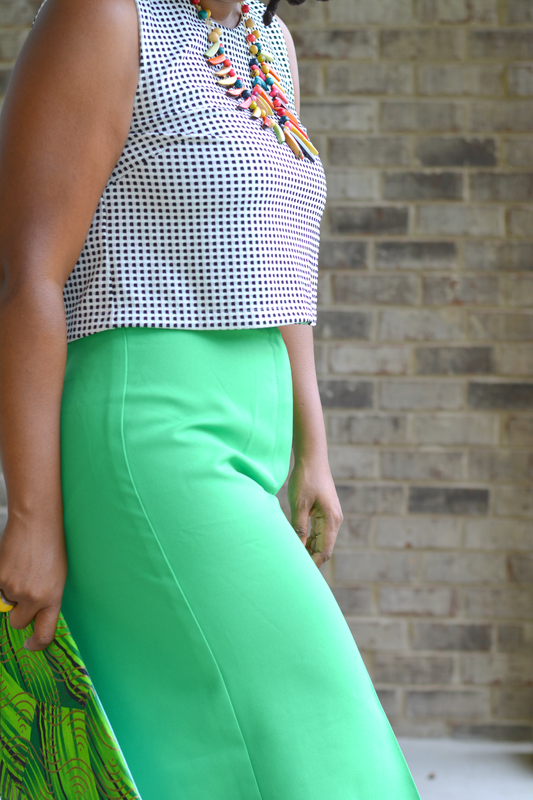 Are culottes making their way into your closet? 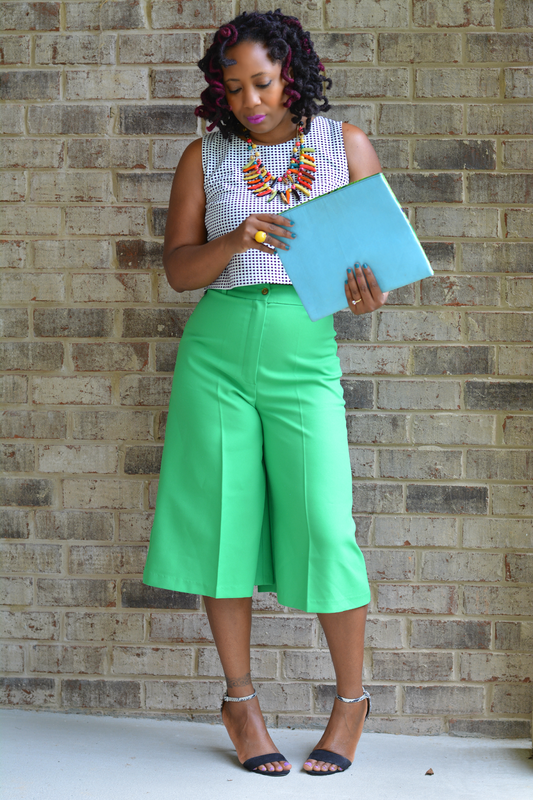 Yes, culottes will be making their way back into my closet. I used to be obsessed with them in my early teenage years. So glad they are making a comeback. 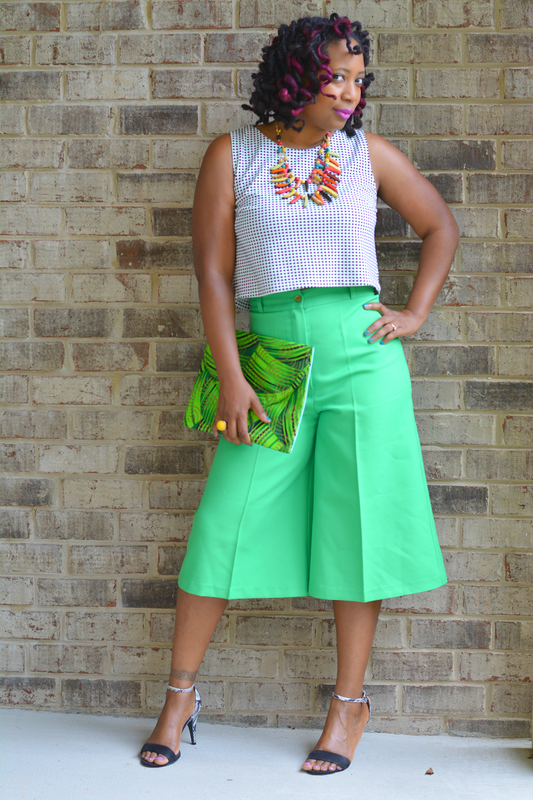 You look lovely in this outfit and the culottes fit you to a tee. They will not be coming back to my closet cause of my famous thighs. . .LOl! 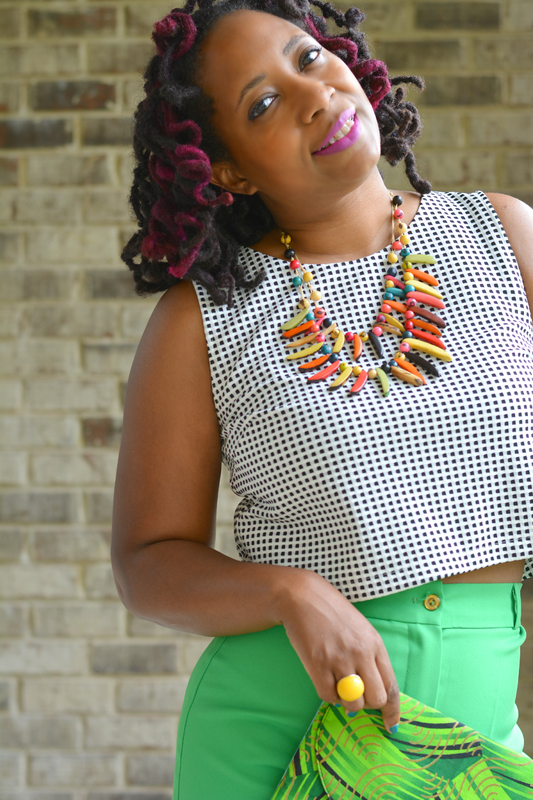 Love this fun outfit on you! 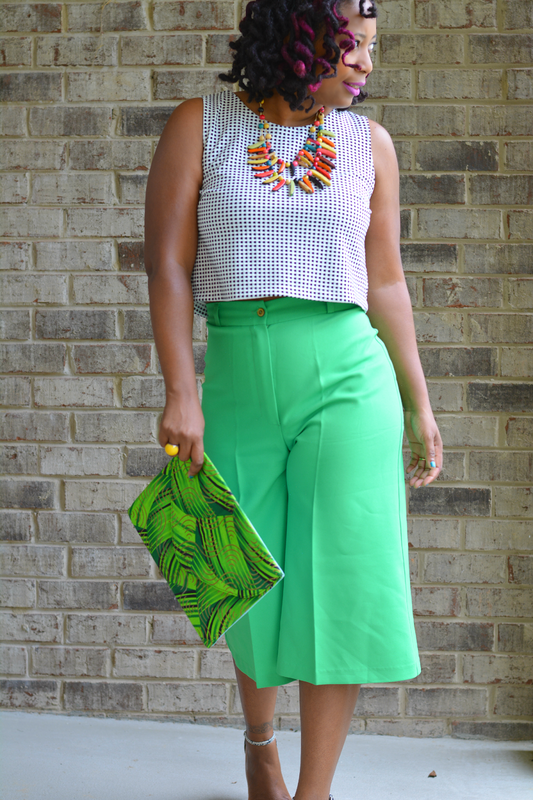 The culottes are super cool and I love how you styled them with a crop top!